At the end of last month, we returned to Foodies Festival in our local area for the fifth year in a row, this time joined by some good friends, who were visiting from Birmingham to enjoy the VIP experience with us. 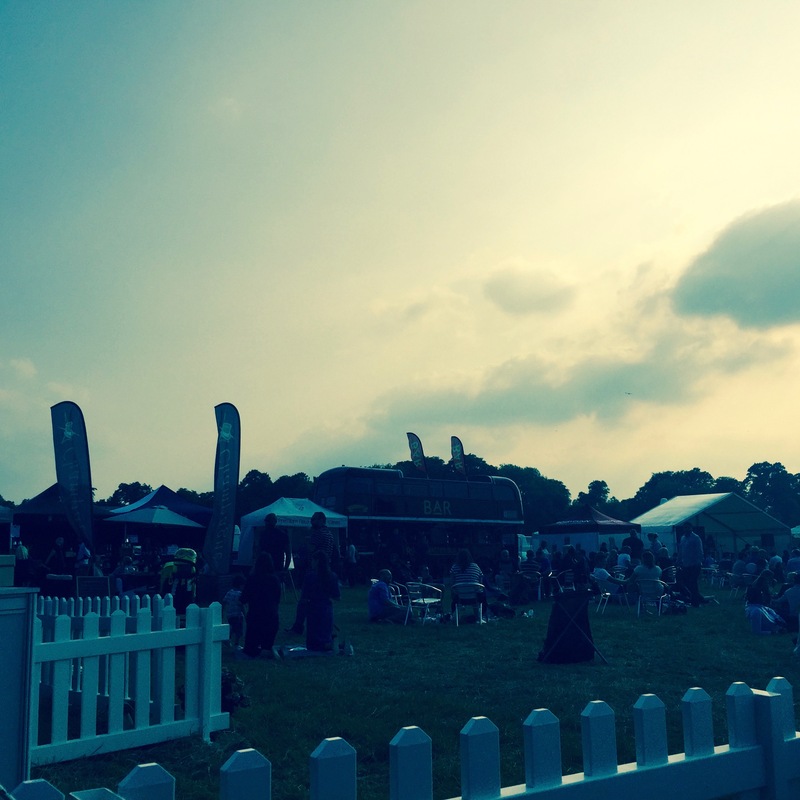 The second year at this picturesque venue, Syon Park, the well established Foodies Festival did not disappoint. 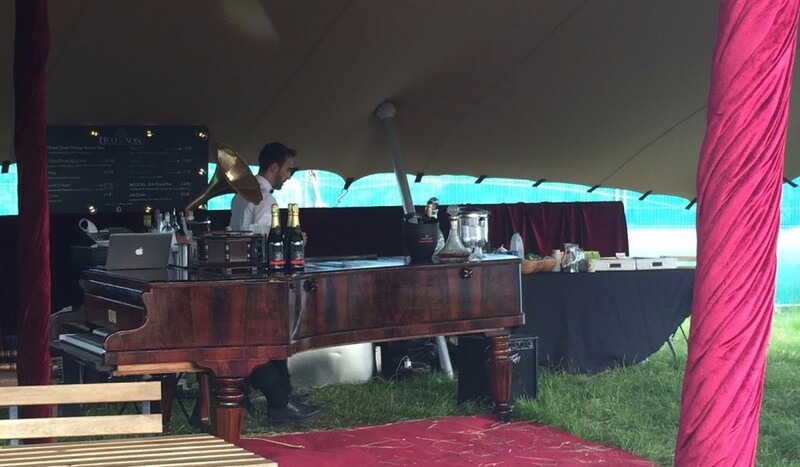 It was even bigger and better than last year, including a beautifully designed VIP tent, with a grand piano bar, comfortable seating area and unlimited supply of tea, coffee, soft drinks and biscuits. After the threat of rain on a muggy morning, the weather actually stayed bright, hot and sunny for us, so we enjoyed a leisurely afternoon strolling around the many stalls, sampling delightful food and drink, listening to the live music, and even enjoying a mobile massage! What a treat – and what a great way to spend a sunny day! 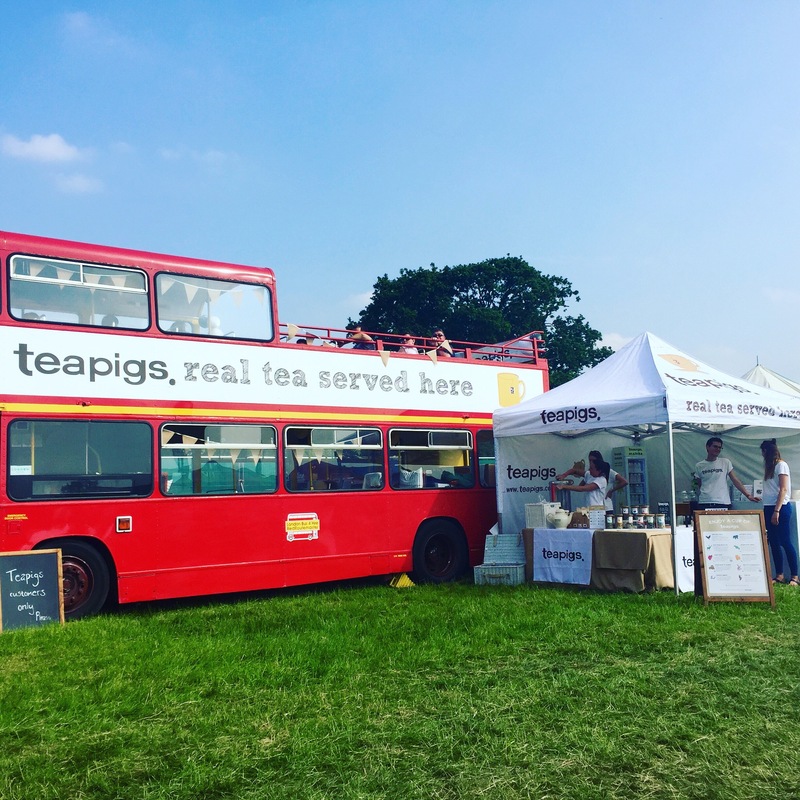 Old tea friends, Teapigs, had a whole double decker bus devoted to tea lovers this time around, and the creative social enterprise tea company, Tea People, were there again this year, as well as our recent tasty treat provider friends from the Surrey Food Festival, Wholesome Bakes, who offer gluten, dairy and nut free cakes and bakes. Other festival favourites from previous years, such as the always impressive Great British Sausage Company, provided tasty snacks. You have to have a top notch hot dog at a food festival, don’t you think? We also enjoyed a truly scrumptious cake decorating demonstration from the vintage-tastic Burlesque Baker, Charlotte White, who we had the pleasure of meeting when we first arrived in the VIP tent and who decorated a delicious chocolate cake with pretty baby blue and silver icing and decorations. My friend, a talented and keen baker, enjoyed the tips on how to make different flower designs for cake decoration. I was also very excited to meet the team behind Silent Pool Gin at the festival, as they are local gin distillers, based nearby in Surrey, and their branding is just exquisite. I bought a set of their delicately decorated green-blue glasses, which I will share in a future post. So, we enjoyed a day of food, fun, drinks, learning about how to prepare, make and decorate food, learning about different drinks, some much needed relaxation and massage, and, as usual, lots of tasty tea. What could be better? Foodies Festival is still running throughout the UK – upcoming dates and venues can be found at FoodiesFestival.com. 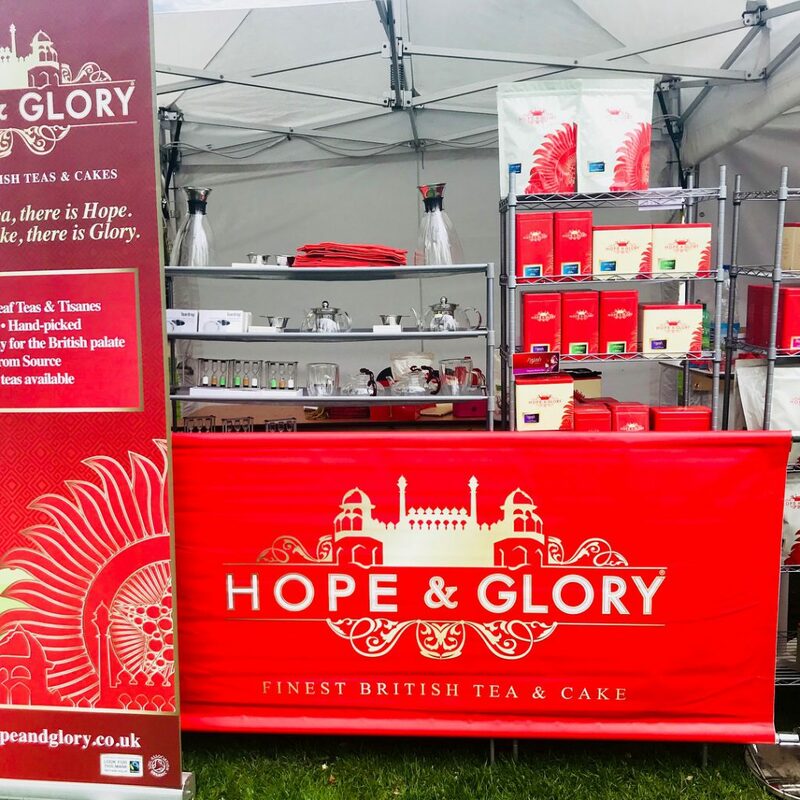 Other Foodies Festival locations in the London area are Blackheath, 8-10th July, and Alexandra Palace, 27th-29th August, and not far away in Oxford, 2-4th September. There’s also a Foodies Festival coming up soon “Up North” in my old neck of the woods, at Tatton Park, 15th-17th July, as well as Harrogate, Edinburgh and Oxford still to come in August and September. I hope you get the chance to enjoy the Foodies Festival experience this year! 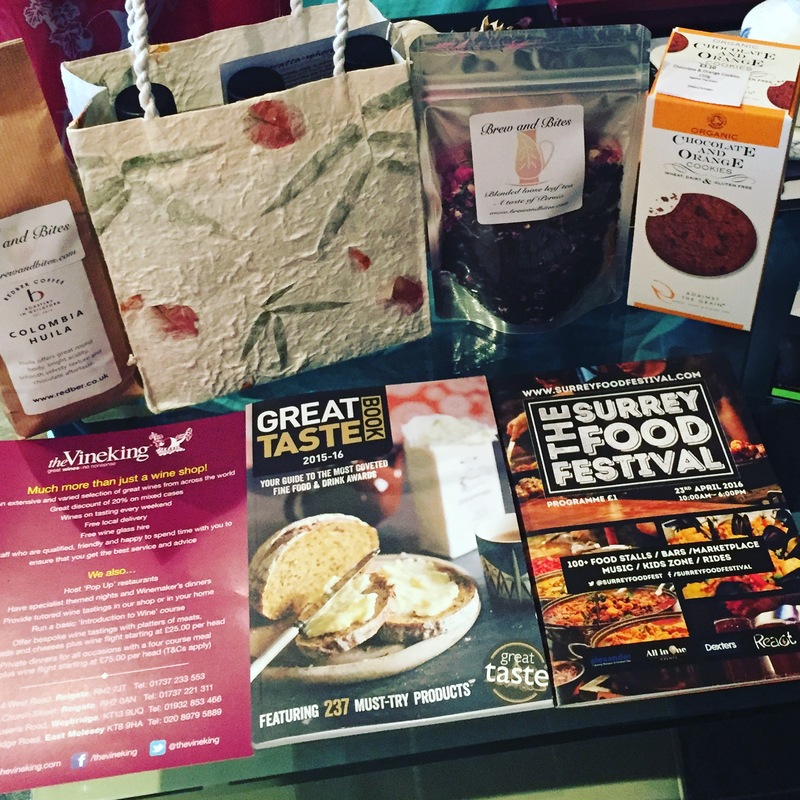 I visited the Surrey Food Festival at Richmond’s Old Deer Park last weekend, and had a lovely time trying out lots of tasty food and drink in my local area and meeting some great people. I met some fantastic artisan food providers, from the wonderfully meaty cuisine of Meat The Chef (chicken skin skin-on fries, anyone? ), to Sussex oil and vinegar makers, Stratta, to the delightful team at tea and sweet treat makers, Brew and Bites, who tempted me with Persian sweet treats and their beautiful tea and coffee blends. I also found plenty of gluten and dairy free fare to taste and take home, thanks to Wholesome Bakes and online marketplace Free From Market. 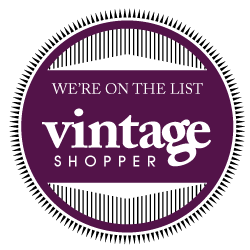 We even bought a few cheeky bottles of wine from The Vineking, which we were able to try out and taste at the festival and then, once we’d got expert advice from the wine experts on the stand, bring our favourites home with us. I returned with an impressive haul: herb flavoured olive oils from Stratta, Rosy Grey tea and Colombian coffee from Brew and Bites, gluten and dairy free cakes and cookies from Wholesome Bakes, and, of course, a cheeky Prosecco and Cabernet Sauvignon from local wine specialists, The Vineking. The obvious thing to do when I got home was to have my own special afternoon tea with my tasty treats, so I brewed up a refreshing and delicate pot of Rosy Grey, a blend of Ceylon black loose leaf tea, bergamot, rose petals and rose buds. 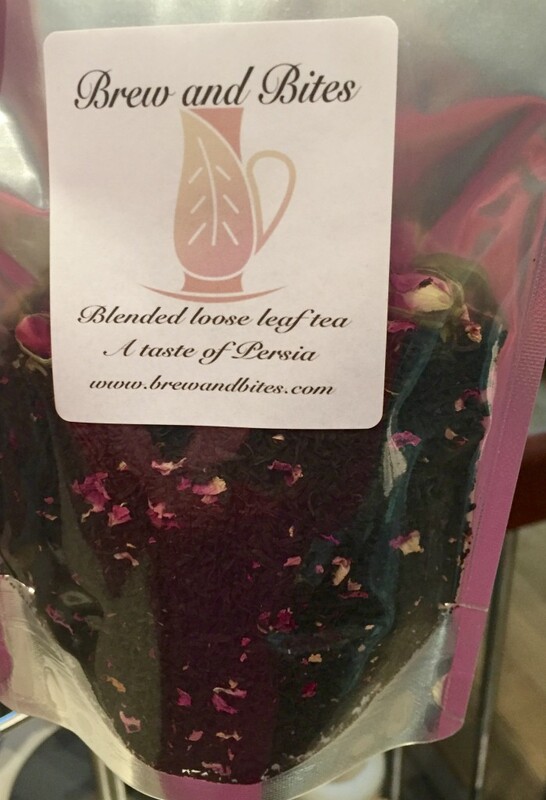 The tea is so pretty and smells divine – almost too good to drink! But drink it I did, and it was exactly what was needed after wandering around outside for a few hours and feeling a little tired after all the fresh air! 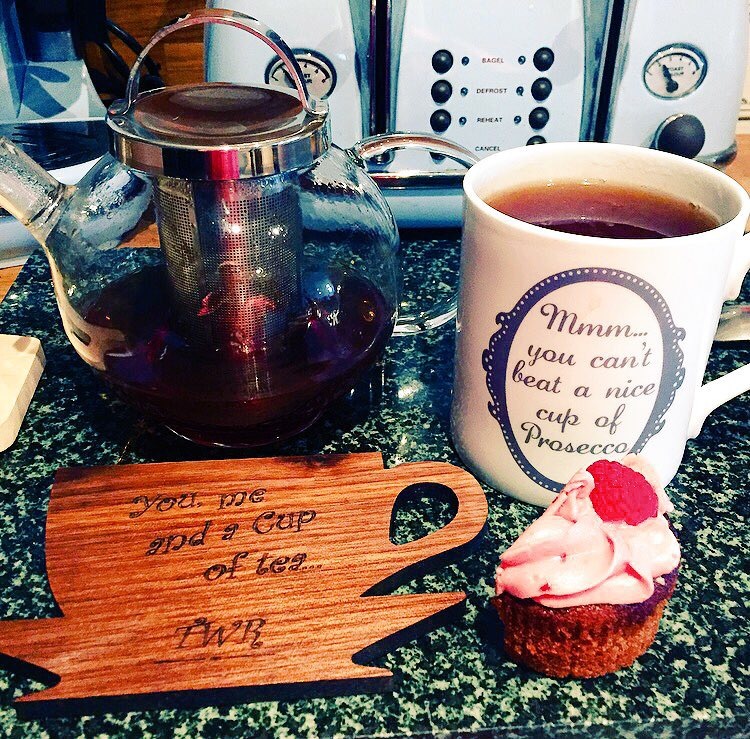 Paired with a gluten and dairy free raspberry cupcake and served on the lovely Tea with Rachael coasters that Individually Inspired made for me, it was the perfect time to take a moment and relax. 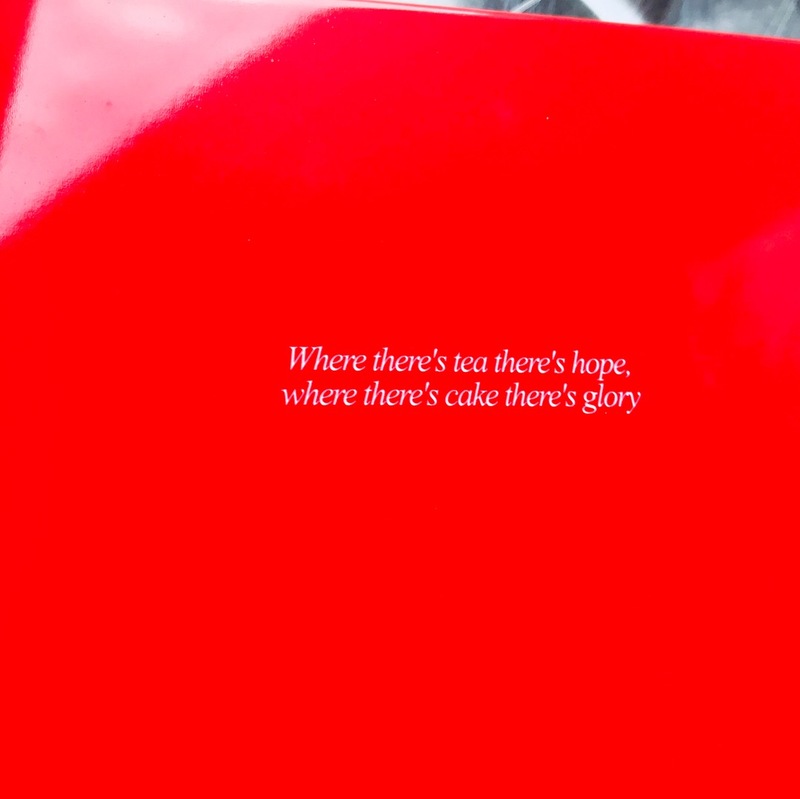 I also had a good look through the show guide and the Taste Awards brochure for inspiration for other fabulous foodie finds! Rosy Grey tea from Brew and Bites – looks and smells too pretty, but tastes just as good to drink! 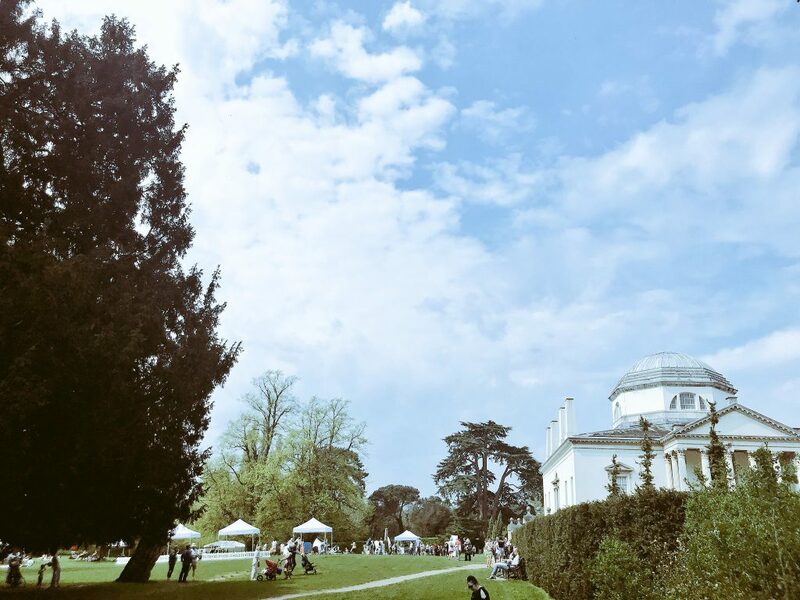 I’ll be heading to Foodies Festival at Syon Park again next Bank Holiday weekend with some fellow foodie friends, so am looking forward to enjoying our VIP tickets and trying even more tasty treats!